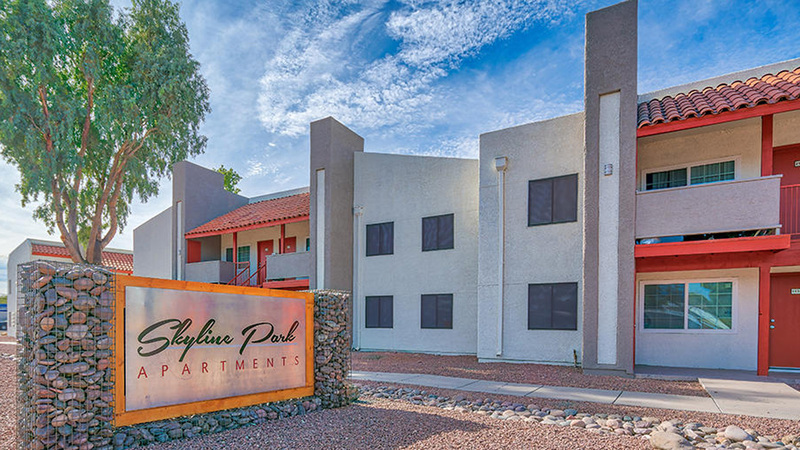 Tucson, AZ – April 18, 2018 – ABI Multifamily, the Western U.S.'s leading multifamily brokerage and advisory services firm, is pleased to announce the $2,600,000 / $43,333 Per Unit sale of the Skyline Park Apartments located in Tucson, Arizona. Completed in 1985, Skyline Park is a two story, garden-style apartment community that features 60 total units in 3 rental buildings, constructed of block and wood frame/stucco. The property has flat roofs and rests on approximately 1.84-acres. The unit mix consists of 36 one-bedroom / one-bathroom units, and 24 two-bedroom / one-bathroom units, with a weighted average size of 560 square feet. Skyline is individually metered for electricity with individual HVAC units throughout the entire property. Outside storage, semi-private entry and private balcony/patio areas are available, with high ceilings in select units. This community also provides its residents with an overhauled swimming pool, newly installed children's play area with a shade structure, dedicated leasing office, laundry facilities, and ample parking. In addition to the many common area and exterior capital improvements throughout the property, nearly 90-percent of the property's interiors also received enhancements. "We're always excited to help facilitate lasting and fruitful relationships between our clients," states Alon Shnitzer, Senior Managing Partner at ABI, lead broker involved with both the Seller and Buyer. "Alpha Wave Investors has become one of the top value-add players in the Tucson market for implementing effective repositioning and renovation campaigns that usually lead to increased property values, while simultaneously providing more turn-key investment opportunities to the new owner. The repeat buyer will have an opportunity to experience the benefits of most of the heavy lifting on the renovation side being complete. The Tucson MSA is experiencing a surge in value-add investments because of limited new supply and continued population and jobs growth." The Buyer, and entity form through Ennabe Properties, Inc., is a private investment company based out of Los Angeles, CA. The Seller, and entity formed through Alpha Wave Investors, is a private investment company based in Laguna Hills, CA. The multifamily brokerage team of Alon Shnitzer, John Kobierowski, Rue Bax, Doug Lazovick and Eddie Chang identified the Buyer and facilitated the introduction between both Seller and Buyer in this transaction. ABI Multifamily (http://www.abimultifamily.com/) is a brokerage and advisory services firm that focuses exclusively on apartment investment transactions. With offices in Phoenix, Tucson, San Diego and recently opened Sacramento, the experienced advisors at ABI Multifamily have completed billions of dollars in sales and thousands of individual multifamily transactions. ABI Multifamily incorporates a global approach with regional real estate expertise to successfully complete any multifamily transaction, regardless of size and complexity.